Be the first to share your favorite memory, photo or story of Love. This memorial page is dedicated for family, friends and future generations to celebrate the life of their loved one. Love Joyce Leflore Schuster, 78 of Eau Clare, WI went peacefully to be with her savior Jesus Christ, surrounded by her family on Friday, August 3, 2018 at Dove West Health Care in Eau Claire, WI. She was born July 23, 1940 in Newport AR, the daughter of the late Jesse James and Frances Ellen (Raines) LeFlore. Love married Dan Schuster in 1961 and from that union came three children, Jaci, Carolyn and Chuck. Love was proud to work for the Wisconsin Job Service and the DOT highways division as a purchasing agent from 1977 – 2005. She was fun loving and flirtatious and had an infectious smile that could light up a room. Love had a passion for bowling, poem writing, Christmas, hockey. She loved spending time with her grandchildren and her beloved dog Ducky. Love was most devoted to her Catholic faith, and lived her life in gods service. She is survived by her children, Jaci Winsand, Carolyn (Don) Johnson and Chuck Schuster; grandchildren, Justin (Shannon) Katterhagen, Alissa Winsand, Kevin, Danni and Cassie Johnson, Jesse (Ashley) Schuster and Kayla (Connor Mattoon) Schuster; great grandchildren, Waylon and Gwendolyn Katterhagen, Emi, Jaxson and Kayden Schuster and Brently Berg; brothers Sonny, Butch, Guy and sister Jan.
Love is preceded in death by her Brother Lynn LeFlore. Mass of Christian Burial will be held Tuesday, August 7, 2018 at 11 a.m. at St. Mary’s Catholic Church in Altoona, Wi. Visitation will be held from 9:30 until the time of service at 11 a.m. at church. 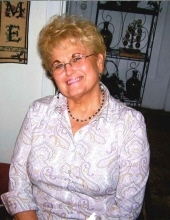 "Email Address" would like to share the life celebration of Love Joyce Leflor-Schuster. Click on the "link" to go to share a favorite memory or leave a condolence message for the family.